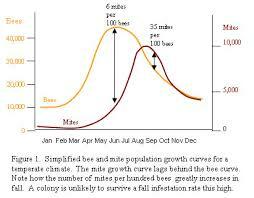 Backyard Bee Hive Blog: Why colonies fail after 18 months & How to prevent it. Why colonies fail after 18 months & How to prevent it. I hear it a lot; beekeepers saying they lost their strongest colony at 18 months. Okay, maybe 20 on the outside. It happens to the best of us. We start a colony with a package in April (or maybe a nuc in May) and we feed and nurture the bees through their first Spring. We watch them grow into Summer and feel like good beekeepers when they go into Fall big and strong. They sail through Winter and we are so happy to see them flying early in March. YAY they made it. Their second Spring and Summer go swimmingly. The bees put up honey, and we pat ourselves on the back. We harvest on Labor Day, and tuck them in for the Winter thinking, "We've got Survivors because they've overwintered and did good. Awesome!" Then one El Niño day in November we go to check on them and nobody's flying. No pile of bees out front. You kick the tires and not a hum. Opening up the hive we find nobody home. There's some honey, no shredded wax to indicate robbing, some pollen, some patchy brood, maybe the tiniest remainder of the Winter cluster yet not a lot of bees on the floor. What happened? One word. Overwintered colonies are prime candidates for succumbing to varroa mite. They have an advantage over a new package in that they start building up as early as February. But they have a disadvantage in that they carry overwintered varroa that start building up early, too. As an overwintered colony explodes in numbers, so do the mites. A strong colony carries the largest load and often masks it from the beekeeper with hygienic behavior. But come that first cold, cold snap when they cluster really tight and there's the least amount of brood, the concentration of mites becomes too much to bear and the colony collapses. Hello, November. Goodbye, bees. To be successful, you must think of yourself as a mitekeeper not a beekeeper. February and March may be the months when overwintered colonies starve, but November through January is when they kick the bucket because of mismanagement of varroa. My advice, advice that I need to follow myself, is DO NOT NEGLECT YOUR BEES IN AUGUST. Drone cull, requeen, treat with MAQS or oxalic acid, whatever you're comfortable with. Your goals are to knock down and outbreed the varroa mite, which takes three brood cycles (63 days). Why 3 brood cycles? Because you are raising the bees that will raise the bees that will be your Winter bees, that will raise your Spring bees. When you go into Winter with a healthy population of bees, you exponentially increase their chances of being alive in Spring. So take this time to raise the cleanest, strongest bees you can. In Denver, the best timing is from August 15 through October 15. Here are some options and why each is good. • Drone Culling: For every one mite riding around on the back of a bee, there are four more hiding inside brood cells. Given a choice, a varroa foundress will breed in a drone cell. If you have any drone brood in August, cut it out. Autumn drones are not long for this world and cutting them out both reduces the number of mouths to feed and lightens the mite load in one fell swoop. This action alone will not save your colony as it does nothing to manage phoretic mites. Varroa mites prefer drones because they take longer to develop. The mites have more time under the protection of the cap to reproduce. In just a few brood cycles, 1 mite in a worker bee cell becomes 8, but in a drone cell 1 mite becomes 27! • Creating a Brood Break: You can alter the population dynamics to favor the bees by creating a brood break at the right time. A good way to do this is by making a split just before the main flow. 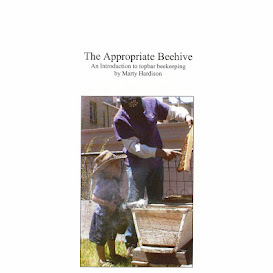 Giving the queen to the daughter hive, the parent hive will redirect its energy from brood rearing to honey making. The solstice is a good date for me as this creates a broodless period during the Linden bloom (honey for me) and plenty of Summer blooms and drones for the bees to raise a new queen that will be well-mated. If you are not interested in increasing your number of hives, you can recombine the split with the parent afterwards. • Outbreeding the Mite: Supposedly a young, newly-mated queen will not slow down late in the year and she can outbreed the mite; Requeening in late Summer can create a brood break that will knock down varroa and send you towards Winter with a healthy population of young bees, which is a key to success. In late July, move the queen to start a daughter colony or simply pinch her. It's important that nectar and pollen are still flowing for the colony to raise a quality queen. When looking at population dynamics, this timing is more impactful than the previous suggestion. But depending on resources, you may need to provide the colony with an already mated queen. Think a split in late July will leave you with two small colonies? A small but healthy population of bees is far superior to a large population of sick bees, so don't worry too much if your bees occupy only one hive body. As a matter of fact, some beekeepers intentionally overwinter colonies in nucs.1 Proper timing of requeening and resulting brood break combined with proper insulation can pull small colonies through Winter without a hitch. • Treat with oxalic acid or MAQS. These inputs come with specific instructions, so read and understand the directions thoroughly. For non-treatment-free beekeepers, you can learn a lot more about these varroa treatment options on Randy Oliver's website. Next November, I promise you, you will see all sorts of posts on Facebook, IG what-have-you by beekeepers who say their colonies absconded. They'll tell you they found hardly any bees bees but there was honey, some pollen, patchy brood, and that they didn't have mites. I don't know why they say that, as if admitting they had mites is some sort of failing. EVERY COLONY HAS MITES. Even though it's #5 on my list of "Well THAT woulda been #GoodToKnow before I started beekeeping," admitting that you are a mitekeeper is the first step to success as a beekeeper.